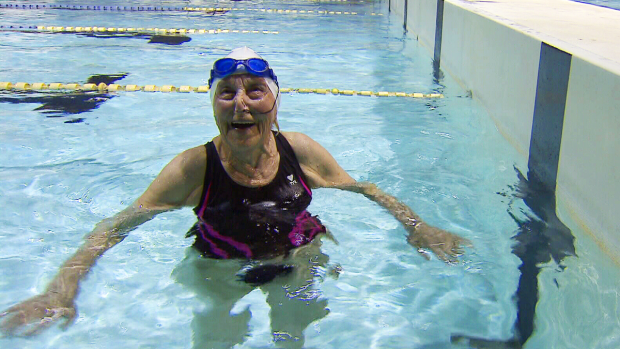 At 95 years old, Betty Brussel feels most at home in the pool. March 25, 2019. The Canada Games Pool in New Westminster is where Betty Brussel feels most at home – and it’s where she’s turned her love of swimming into more than just a hobby at the age of 95. Brussel grew up in Holland, where she swam as a girl in the canals. 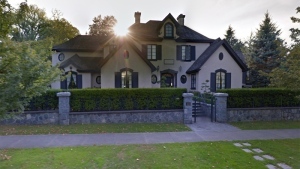 She stopped when she moved to Canada in the ‘60s, but picked it back up again in the early '90s, competing in the Seniors’ and World Masters Games. "That was a bit more competitive, and I did alright," Brussel told CTV News. "I have a big bag of medals. It's so heavy I can hardly carry it." The medals started coming after Brussel began working with a coach. Carol Gair, who has coached since 1954, said she always noticed Brussel by herself at swim meets, and started going over and giving her tips. Now the two work together weekly. "She just gives me little pointers, and she improves my breaststroke a lot and freestyle, and I also have little tips from other swimmers," Brussel said. Gair also helped Brussel tap into her competitiveness. "I said, you should be breaking records, and she said, I’m not interested in records," Gair said. "Then after the last meet, where she broke the world record, she emailed me and said, I was looking and noticed in the world records there’s a lady who has the 100 and 200 breaststroke and I’m faster than she is. I can break her records." Yes, you read that right: Brussel is a world record holder. Last month, she shattered the 50-metre breaststroke world record for women aged 95-99. She also holds a number of provincial and national records. "Oh I am competitive. I go for it. But I'm not really training, I just swim and I do the best I can and give it my all, and that's all you can do," Brussel said. In the end, Brussel says the medals don’t matter to her, and what she enjoys the most is the feeling she gets when she jumps into the pool. "I feel young. I just feel young. I feel really good and you forget everything. I'm a happy person...but in the pool I’m really happy, I just love it."